Pineapple provides aesthetic tastes and taste experiences. The pineapple cleanses the palate from having an overly fatty and savory taste. 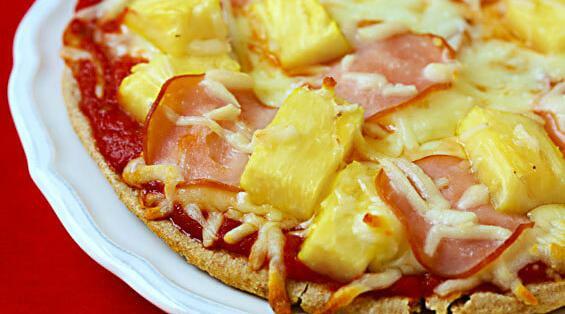 Pineapple makes pizza more summery and lively. Pineapple complements the acidic tastes already in pizza, as it's acidic too. Standard pizza sauces--tomato-based sauces--are acidic, so any topping that's also acidic has a good chance of making a good combination. Traditional toppings like pepperoni, olives, peppers, sausage, even mozzarella cheese are acidic foods that taste great together. Likewise, pineapple or other acidic fruits can work well with other acidic toppings. Pineapple synergistically complements other toppings to make pizza overall taste better. The taste is unusual, which is a good way of changing a routine. Pineapple makes the pizza taste awful in a way which fruit should not be on other foods. The sweetness of the pineapple is a bad fit for the general taste of the pizza. Pineapple is already part of a meal (like in a drink or dessert). So while adding pineapple to pizza might enhance its taste, it becomes an overkill to the overall meal experience.